If you are a regular visitor to Constantly Cooking, you may have guessed that I am more than a little infatuated with kale. Not only is it a nutritional powerhouse, it adds great colour, texture and flavour to any meal. The natural pairing of apples and cheese makes this salad super tasty; the apple cider vinaigrette provides a nice, balanced dressing for the salad. If you’d like to add nuts to this bowl, lightly-toasted pecans would be delicious. Check out the links at the bottom of this post for some other outstanding kale salads. 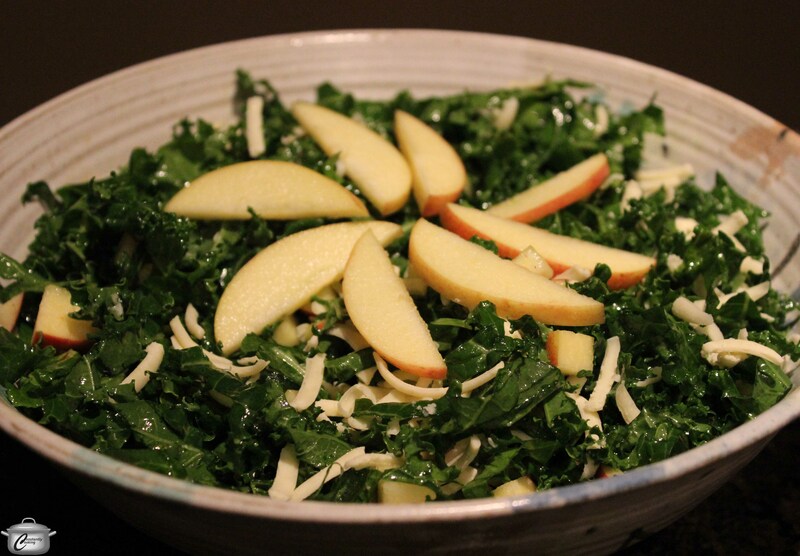 Crisp apples, sharp cheddar and an apple cider vinaigrette make this kale salad colourful and delicious. * I like to use Gala – also called Royal Gala – apples as they are far less prone to browning after being cut. Wash kale leaves and spin or pat dry. With a sharp knife, shred the kale into small bite-sized pieces. Put approximately 6 cups (1.5 litres) of the shredded kale in a serving bowl and reserve the rest for another use. To make the vinaigrette, combine cider vinegar, salt, pepper, Dijon and maple syrup in a jar with a tight lid. Cover and shake well to combine. Add the olive oil; replace the lid and shake vigorously until well blended. Cut the apples into ¼ inch (6 mm) dice. The easiest way to do this is to cut around the core and dice the sections. Drizzle the dressing over the shredded kale and with your clean hands, massage the dressing into the kale. This helps soften it and ensures that the dressing is evenly distributed. Add the apples and cheese to the kale and toss quickly to combine. This entry was posted in Salads, Vegetables and tagged apple cider, apples, Cheddar, dijon, Gala, kale, maple syrup, olive oil, salad, vegan, vegetarian, vinaigrette. Bookmark the permalink.